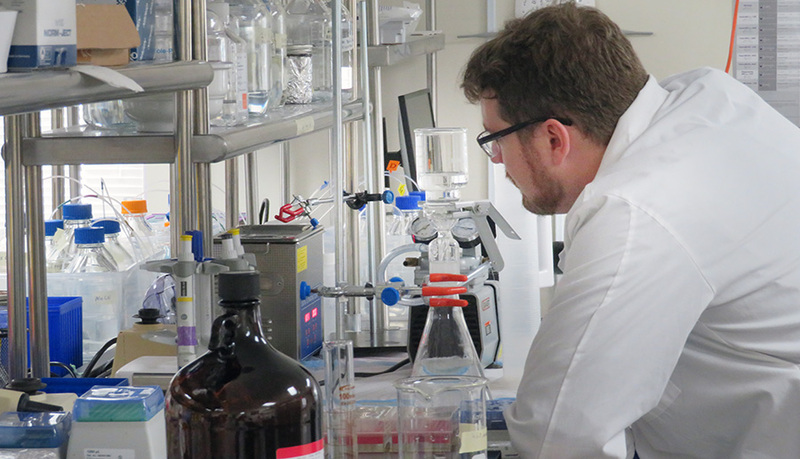 Ichor employee and ESF doctoral student Kris Grohn in the lab. The State University of New York College of Environmental Science and Forestry (ESF) and Ichor Therapeutics are partnering to train graduate students in researching drugs that could combat age-related illnesses. The educational component will occur at ESF, where students will focus on biochemistry, chemistry or bioprocess engineering. Their laboratory research will primarily occur at the facilities of Ichor Therapeutics in nearby LaFayette, New York. Ichor is a pre-clinical drug discovery and development company that specializes in mechanisms of aging. The scientific study of human aging has exploded in recent years, driven by a growing understanding of age-related disease and associated molecular pathways. The use of drugs for targeted purposes, such as selectively destroying toxic senescent (aging) cells, has been identified as a method for increasing mammalian lifespan. This has led to a demand for qualified post-graduate-level scientists to support emerging pharmaceutical companies, such as Ichor Therapeutics. The low cost of living in Central New York, combined with affordable real estate and access to intellectual capital and core facilities from nearby universities, has allowed Syracuse-based companies to maximize the impact of investment dollars while building out physical laboratory space. "Central New York is a prime location for start-up and established companies in the life sciences," said Kelsey Moody, CEO at Ichor Therapeutics. "ESF has been an incredible collaborator throughout our growth on numerous fronts, spanning product formulation, bioprocess/manufacturing and mechanistic studies. We are eager to further build our relationship with ESF through the launch of this initiative." Dr. Chris Nomura, vice president of research at ESF, said, "This initiative will allow graduate students to leverage their work experience at Ichor Therapeutics with the scientific expertise of the world-class faculty at ESF. This represents an ideal industrial-academic collaboration." Students interested in applying for graduate school through this initiative should contact Stephanie Martens at stephanie.martens@ichortherapeutics.com for further details. About SUNY-ESF: The SUNY College of Environmental Science and Forestry has developed innovative programs in a broad range of academic areas related to biology, chemistry, engineering, management, design and planning. The college focuses on educating problem solvers who will help develop the science and technology for a sustainable future. About Ichor Therapeutics: Ichor Therapeutics, Inc. is a premier, vertically integrated contract research organization that provides pre-clinical research services for aging pathways. Proceeds from this work are used to support R&D initiatives that constitute Ichor's portfolio companies in small molecule drug discovery (Antoxerene, Inc.), enzyme therapy (Lysoclear, Inc.), antibody mimetics (Auctus Biologics, Inc.), and protein engineering (RecombiPure, Inc.). Ichor and its portfolio companies operate from its corporate offices and research laboratories in rural LaFayette, New York (just south of Syracuse). The company is eager to engage collaborators in the life science industry and in academia who share its vision of delivering next generation therapies for the illnesses of aging.